In the States, you can pick up a rock and toss it in any direction … and hit a Starbucks. In Canada, it’s another name and store. I spied a new coffee offering in my supermarket K-cup display. This one is marked with a logo familiar to many who call Canada home. “Tim Horton’s” is very similar to Duncan Donuts here in the US, a nice little store that can be found pretty much everywhere. They serve lots of good coffee along with some of the most decadent pastries I have ever seen. Yes, they are mostly donuts and their variants, but I’ve personally never seen a collection of colors, frostings, sprinkles and fillings like I did at a Tim Horton’s in Ontario some years back. They are everywhere, and they are always, always occupied with hordes of locals tossing back coffee and packing away calories to fight off the cold. I had a cup of the standard drip, prepared “regular” which means sugar and cream. It tasted quite satisfying, a dark, full bodied roast that stood up to the add ins. Maybe it was the cool air, but I recall the smell of the brew to be particularly attractive. It was full and fresh, just a few minutes old. I had it with a glazed donut of some design and called it breakfast. A happy memory which always leaves me wondering why “Timmy’s” as the locals sometime call their stores haven’t tried a legitimate expansion into the United States. There’s always room for good coffee and donuts in my opinion. Anyway, I was brought back to this experience when I saw Tim Horton’s cups in the supermarket. I was only able to snag a decaf box, as all the regular seemed snapped up. (Hmmm…. maybe people DO know about Horton goodness here in the Southern United States). While I would have preferred the regular for a test drive, I’ve been sampling the decaf over the past few days. I was wondering if this K version of this memorable cup could live up to my expectations. Rarely does popular coffee outlets make the jump to the Keurig Universe without bumps and jolts. Horton’s was not an exception. The actual cup is a rigid side version, not one with the expanding folds that are filtering into the market. It worked without issue in my machine, and when set to the large mug size offered a slightly weak looking cup of decaf coffee. The flavor of the coffee was a bit on the bright side, more of a medium roast than anything taking on a lot of roast characteristics. It was by no means bold. This particular K-cup yields better when set to a medium mug setting, and there’s no way to steal a second brew. I want to say that the decaffeination process steals a good bit of personality from these beans and what you get is a cup that tastes … just okay. Not horrible and I will finish the box, but not something you make a special trip for. And it is certainly not in agreement with the robust and heat-giving cups that the real Horton’s serve north of the border. This is not complete thumbs down. It is a satisfactory cup of decaf, just nothing to write home about. Especially if your home is in Canada. I will keep an eye open for the caffeinated version at my local store and see if that fares any better. 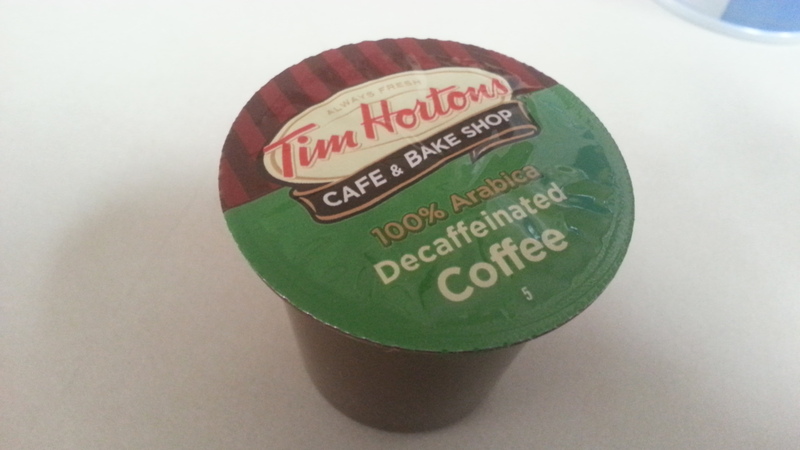 I was able to find and sample Tim Horton’s regular coffee in K-Cup. Again, it was satisfactory, but not a coffee that you would want to drive across town for. It is not the cup you’ll get at a Tim Horton’s Bake Shop. The brewed cup is overly bright and thin, with some grassy aftertastes that I did not find overly pleasing. Like the decaf version, this cup is simply “okay,” but not a brand you would consider paying a premium for. Is it the exact same stuff they brew in the restaurants? Perhaps, but the translation to the Keurig system and the very short brew time may limit how well this brew can match the store brewed cup. The upshot: If you have access to Timmy’s, simply drive in and grab a cup, maybe some baked goods. You’ll spend about the same money as you would on a 12 pack of these cups and have a much better time.